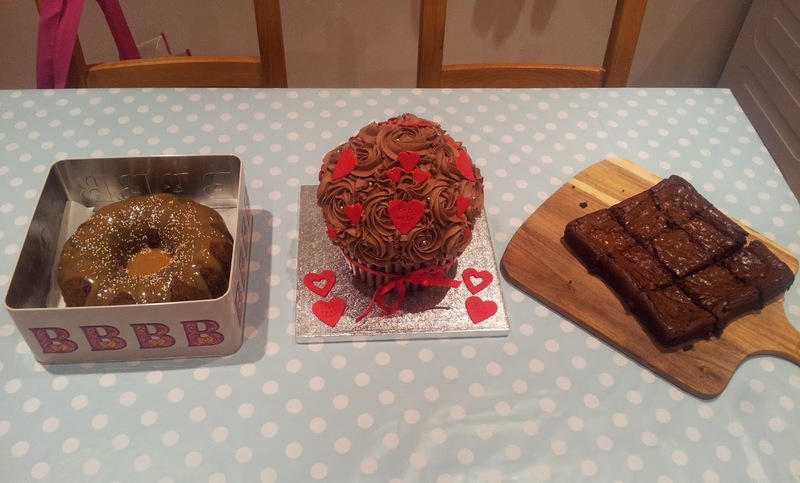 Sometimes cupcakes get a bit of a hard time, whether it’s the ratio of sponge to icing then there is the name – is it a cupcake, a muffin or a fairy cake? Personally, I really enjoy cupcakes, they are easy to whip up and are great fun to make with kids. Sometimes though you want a full on cake but something with a bit more of a wow factor and that’s when I think giant cupcakes come into their own. 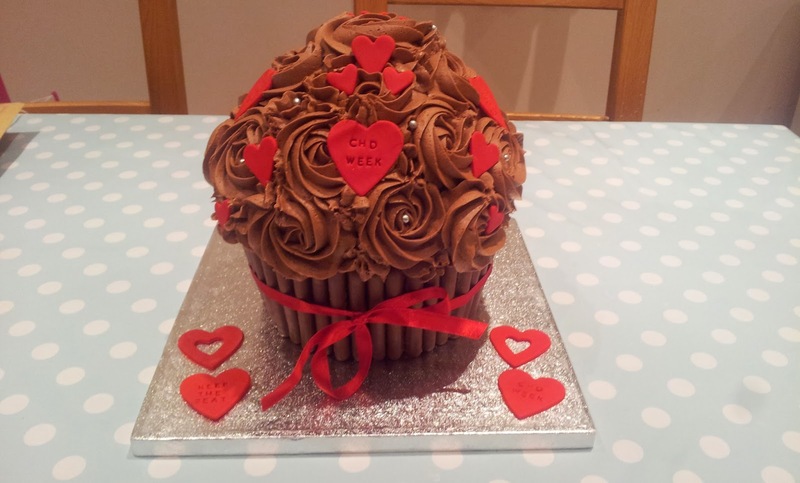 I adore making giant cupcakes, they have the size that you get with a normal cake but then they also have the fun that comes with a cupcake. I have also found they make ideal raffle prizes which is what led me to make this chocolate one a few weeks ago. 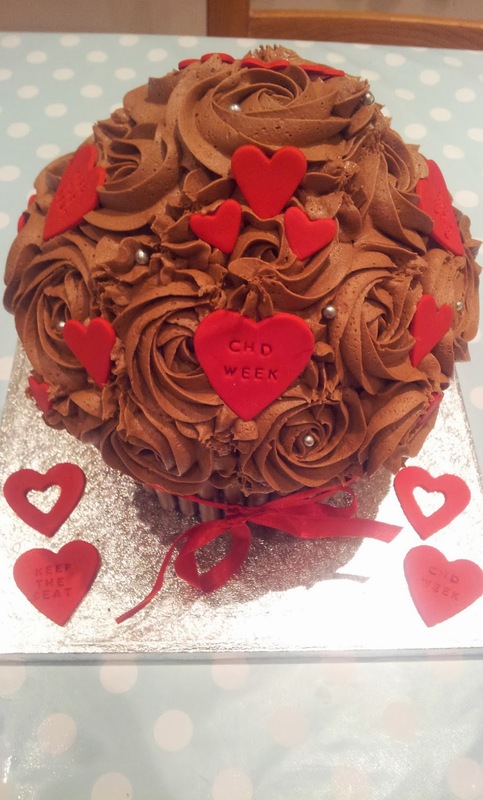 The son of one of my colleagues has a serious heart condition so when he mentioned to me that Congenital Heart Defects week was coming up and he was wanting to do some fundraising for it at work I knew this would be something nice to raffle and also raise lots of money for Keep the Beat. They are a charity that have helped him and his partner while their little boy is hospital and we wanted to raise as much money for them as possible. 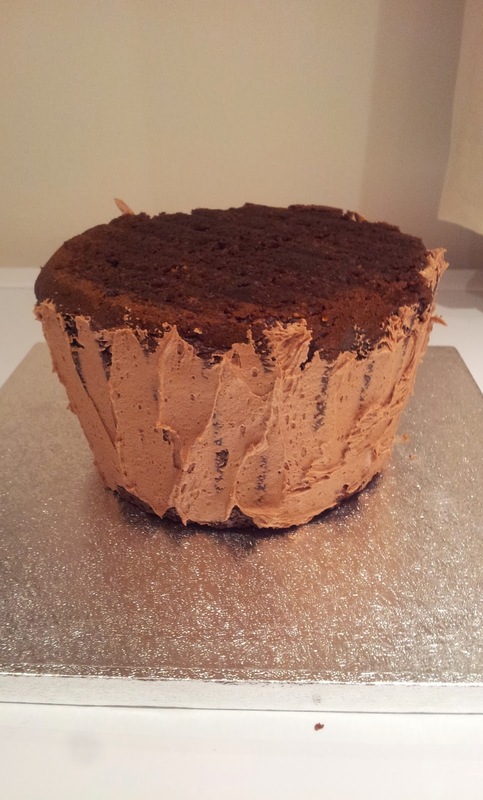 Giant cupcakes are pretty big but I’ve found my trusty chocolate cake mixture fits my mould perfectly. As always this particular recipe uses measuring cups but it also means it’s a very quick cake mix to throw together! Divide between the two halves of the mould and place in the oven for 1 hour until a skewer inserted comes out clean. The bottom half might take an extra 10mins, if this is the case just take out the top half, set aside to cool and put the bottom half back in the oven. Leave to cool for half an hour in the moulds then gently peel out of the mould and leave to cool on a wire rack. If you are using the metal tin I would advise leaving it in the tin to cool completely. Add the cocoa a little at a time until it tastes chocolaty enough. I never weigh the cocoa, I just go on sight and taste. Also add a little more milk so the buttercream is smooth but still holds it shape enough to pipe. Keep beating for another few minutes until it is light and fluffy. Level off the base of the cupcake and coat in a thin layer of buttercream. Stick chocolate fingers all the way about the base and tie with a ribbon to secure. 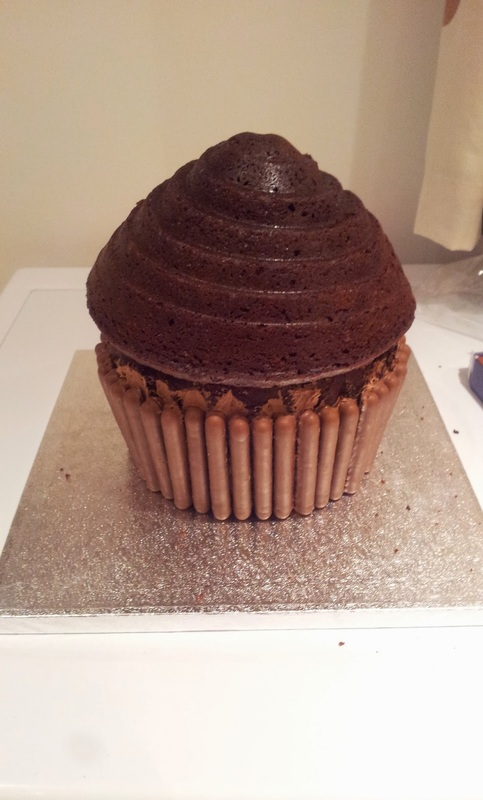 Pipe a generous amount on the top of the base and place the top half of the cupcake onto it. Using a Wilton 1M nozzle, pipe rosettes and stars all over the top of the cupcake making sure to hide the join between the two halves. 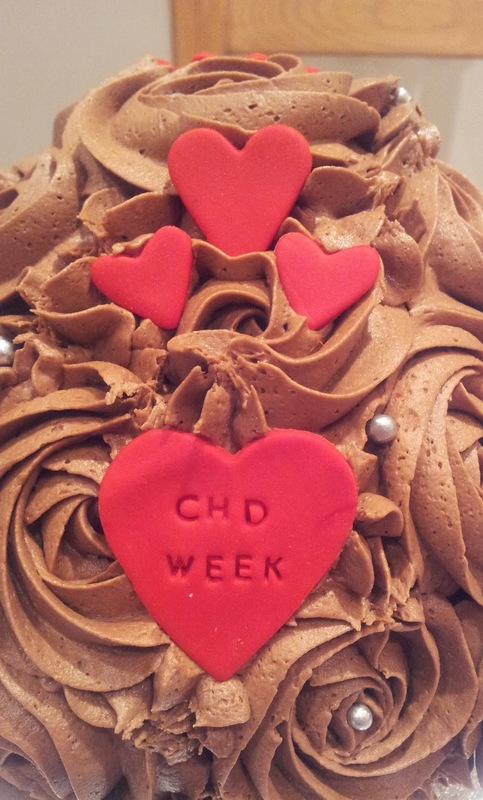 Add any decorations that you wish, I decorated this in support of Congential Heart Defects Week. If anyone wants to support Keep the Beat or see the fantastic work they do, check out their website here.